It's 10:30 a.m. and a group of office workers are desperate for a pick-me-up. One of them reaches for a KitKat bar, the crunchy chocolate treat made by international food and beverage company Nestlé S.A. He opens the package. Instead of chocolate, he breaks off a hairy finger of an orangutan. He takes a bite; blood spurts on the computer keyboard and runs down his chin. He casually wipes it away with his sleeve. His co-workers look horrified. This was a online video released by the environmental advocacy group Greenpeace in 2010. "Give the orang-utan a break," says the message on screen, switching from the office setting to footage of orangutans creeping up a single tree in a clearcut forest. "Stop Nestlé buying palm oil from companies that destroy the rainforests." Scott Poynton, executive director of the Forest Trust. Photo courtesy of TFT. The clip went viral and Nestlé was furious, demanding that YouTube remove the video for copyright infringement. But it quickly became clear that the company would need to face the problem of its palm oil sources, a relationship that was steadily earning it a bad image as a driver of deforestation in Southeast Asia. 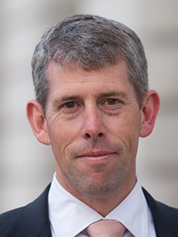 Nestlé turned to Scott Poynton, executive director of the Forest Trust (TFT), for advice. Although Nestlé had carried a sustainable palm oil policy since 2009, it hadn't been effective. With Poynton's guidance, the company pledged to work on the ground with suppliers to make sure palm oil didn't come from illegal plantations. They would take the proper steps to make sure a plantation was established with the consent of local communities, protected sensitive peatlands and didn't clear forests that contained high amounts of stored carbon. Poynton doesn't mince words when talking about his work. He is gregarious, a quick speaker, peppering his talk with anecdotes, jokes and jabs at his critics. He is relentlessly passionate about the natural world, but pessimistic about government-centered action to stop deforestation, like REDD+, a U.N.-backed mechanism that seeks to pay countries to keep forests standing. TFT negotiated major deals last year with two of the worst perceived offenders on deforestation. In February, Asia Pulp and Paper, the world's third-largest pulp and paper company in the world, agreed to stop cutting all native forests, establishing plantations on carbon-rich peatlands, or disrupting lands that host a variety of wildlife with the help of TFT and Greenpeace. Ten months later, TFT, Climate Advisers and consumer goods company Unilever won another no-deforestation commitment from Wilmar International Ltd., the world's largest palm oil trader. Wilmar agreed to halt deforestation -- not only in its own plantations, but on the lands of the hundreds of suppliers. This commitment, if properly enforced, could revolutionize the palm oil business (ClimateWire, Dec. 10, 2013). "They took the bad boy of the palm oil industry and transformed them into an industry leader," said Glenn Hurowitz, a managing director at Climate Advisers. Another thing that distinguishes TFT: If there are challenges, Poynton and his team will identify them. "There's a lot of consulting companies that work inside companies to try to make them greener, but there's very few companies that have an insider approach that you can trust to walk away when the relationship isn't producing results," Hurowitz said. Good cop and bad cop? Greenpeace, the organization who incited Nestlé to come to TFT, acts as a counterbalance to TFT's work. In the Asia Pulp and Paper agreement, it acts as the environmental watchdog to Poynton's business savvy. "What TFT's done is they've [been] translating the language into business-speak and helping them make a plan," said Rolf Skar, a forest campaigner with Greenpeace who collaborated with TFT on the Asia Pulp and Paper policy. And when things don't work, TFT has walked away. A large international bank -- Poynton prefers not to name and shame -- is one example of an institution that did not bring its practices to TFT's standards and is no longer a member. TFT recently ended its troublesome relationship with the timber company Perum Pehutani when it became clear its employees would not stick to its "Drop the Guns" policy, an effort to disarm enforcement officers. But cynicism has arisen around TFT, especially surrounding its work with Asia Pulp and Paper. The company has long been viewed as one of the worst stewards of the forest as it slashed thousands of acres of pristine forests, removed the endangered Sumatran tiger's habitat and tricked locals into handing over their land rights. 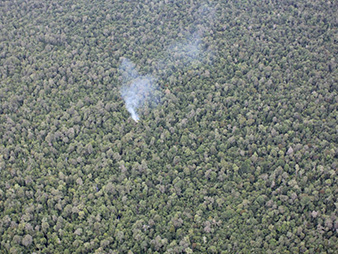 Bad business: Smoke swirls above an illegal logging operation getting underway in a protected area in Indonesia. Photo by Glen Hurowitz, courtesy of Flickr. The World Wildlife Fund, one of the largest and more business-friendly environmental groups, is one of the groups suspicious of TFT's ability to act as an independent third party. WWF tried to get Asia Pulp and Paper to commit to a no-deforestation pledge in 2004. Months later, it was clear that the company was not interested in change. WWF's outposts in Indonesia and other groups in the same network published two accounts of the company chopping down natural forests last year, after Asia Pulp and Paper announced its new policy. In March, a consortium of forest-monitoring organizations in Kalimantan -- the Indonesian portion of the island of Borneo -- lodged a complaint that two suppliers to Asia Pulp and Paper were digging peat canals and clearing natural forest in orangutan habitat. TFT looked into the complaint and found that an unrelated palm oil company -- not Asia Pulp and Paper -- was responsible for the destruction. But the complaints continued. The consortium, known by the acronym RPHK, rejected this conclusion. It repeated its concerns after a December report found that the company's suppliers had failed to save 1,400 hectares (3,459 acres) of natural forests. In May, another nongovernmental organization, called Eyes on the Forest, released a report finding that suppliers to APP were continuing to deforest and dig trenches in peat soils in Riau province on the island of Sumatra. "There is a long track record of reneging on promises," said Linda Walker, manager of the World Wildlife Fund's forests team. Although Asia Pulp and Paper's policy has commitment language, it has no detailed, auditable milestones, she said. World Wildlife Fund has also called into question Poynton's impartiality, playing the role of both a paid contractor and an enforcer of the policy. "We consider them a second-party entity; that's different from hiring an independent third-party auditor," said Walker. It's possible for Asia Pulp and Paper to clean up its act, but until then, companies that wish to support sustainable practices should continue to wait, said Walker. APP is not the only company under attack for its policies. The group Forest Peoples Programme published a report alleging that subsidiaries of Golden-Agri Resources -- a palm oil company that struck a deal with TFT in 2012 -- was taking land away from indigenous communities to put aside for a study on areas of high conservation value. An article from Yale University's Environment360 website suggested that TFT and Greenpeace had concocted a "good cop-bad cop" routine: Greenpeace shames the company, and TFT comes to offer corporate comfort. "This is a lot of power in the hands of one organization -- and one man," wrote journalist Fred Pearce. "[Activists] are reluctant to take Poynton's gut feelings on trust. They want to know more about the deals he is striking with companies, preferably with contracts published online." To Poynton, the relationship with Greenpeace works the other way around. Greenpeace serves as the instigator but also the arbiter of good implementation. "If we are greenwashing and saying APP or whoever is doing a great job, Greenpeace will take us down as fast as anyone," he said. "There are checks and balances." Poynton acknowledges that these policies aren't perfect. He expects, even welcomes, grievances and the opportunity to respond to them. APP has made mistakes, but it doesn't lack commitment. TFT signs nondisclosure agreements with its members, allowing businesses to disclose the inner workings of the corporation without concern that the information may become the target of environmentalists' ire. "We work on the basis of trust," he said. "They don't want any part of that put in the public domain." "I wouldn't underestimate the power of Scott's charm to persuade business leaders to do the right thing," said Hurowitz, of Climate Advisers who helped the Forest Trust forge a deal with Wilmar. Poynton was born in a suburb of Melbourne in Australia's Victoria state. As a child, he wanted to be a veterinarian, but at 15, he listened to a radio program on Richard St. Barbe Baker, a then-90-year-old British forester who had planted thousands of trees. In the 1980s, he began working for Tasmania's government forest service. The Hobart Wilderness Society, the local environmental organization, had set up a stall in the street market to distribute literature and information on the degradation on the island, said Poynton. On his end, Poynton set up a small wood market at the major tourist center in Hobart, a way to engage green groups and explain how wood harvesting was necessary to sustain an indigenous craft market. "I got abused and spat at and screamed at," said Poynton of the experience. But his actions at the time reflected a spirit of compromise between environmentalists and foresters, said Bob Gordon, formerly a managing director with Forestry Tasmania who hired Poynton. "It was part of Scott's nature; he's always trying different things, trying to get a different way with something, trying to make sure that there's a better way of communicating with people," said Gordon. Wilmar, the palm oil company that signed a deal with TFT in December, has an agreement that is the most ambitious to date and arguably the easiest to fail. The company controls 45 percent of the palm oil market, trading millions of tons of the oil around the world. About 80 percent of its product comes from third-party suppliers, making it difficult to oversee how the oil palm is cultivated down the supply chain. TFT is looking at the high-priority areas in the region, looking out for suppliers that have cut down native forests, illegally dug through peat soils and gained access to land without full consent of residents. It will be stressful, and seemingly impossible from the company's standpoint. This is where Poynton stops being a forester and becomes a psychologist of sorts. "[I'll be] giving them a good verbal slapping and saying, 'You're bloody stupid,'" he said, when companies seem ready to give up. "Other times, it's about putting your arms around their shoulders and saying, 'Don't panic; you're not going to fall in.'"